The iconic Brazilian Steak House on La Cienaga in Beverly Hills is probably still basking in the glow of the Olympics, but rather than resting on their laurels, they have introduced some new menu items. Those include a gargantuan Shrimp Cocktail and a Roasted Butternut Squash Salad and a Pear & Endive Salad. All this of course complements their well documented meat selections, which are brought to the table in an “all you can eat” concept. A large spacious restaurant with plenty of buzz and activity, the Shrimp Cocktail comes on a large bed of ice while the six shrimp can easily be shared making this an excellent start to a meal. Malagueta Sauce comes with the shrimp or you can also try the Mango Chilean Sea Bass, which is a Brazilian take on a South American classic that has been popular in Southern California for decades. The Roasted Butternut Squash Salad is the latest addition to the already overflowing salad bar that the restaurant has become famous for. The squash is peeled and cut into 1 inch cubes and mixed with a large selection of ingredients such as cinnamon, granulated garlic, honey, kosher salt and pepper. After roasting, it is then chilled for an hour before being put on display after being sprinkled with dried cranberries and feta cheese. 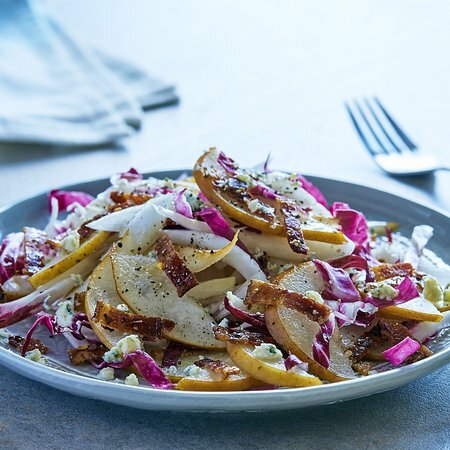 The Pear Endive Salad features a pear vinaigrette that smothers the salad, which is also topped off with strips of chopped bacon and blue cheese crumbles and sprinkled with black pepper. However the restaurant is really all about meat, and with sixteen different selections to choose from, it is really a carnivore’s paradise, although both times I have been here I have eaten a lot less meat than originally planned. The meat is cooked in original Brazilian “churrasco style,” which is cooking large cuts of meat over open flamed pits, which preserves the tender flavor of the meat. The temperature of the meats can be selected so you can have it raw or under cooked if you like that style, although there is of course a disclaimer about that in the menu. Patrons control the service with a small green and red sided chip. The green side tells the gaucho servers to bring out more skewers of meat, while the red side indicates “no mas.” However if you get puckish again you can still switch back to the green side. The meats include Filet Mignon, Rib Eye, Leg of Lamb, Pork Ribs and more, meaning this is an excellent spot for entertaining out of town guests. There are rival spots in town that are slightly cheaper, but Fogo has established itself with a solid reputation as a premier dining spot. All the cocktails here are Brazilian inspired and I just tried the ‘Fogo Premium Caipirinha, a sweet tasting drink with premium aged Cachaca, fresh limes and sugar. The wine list is quite short but I would advise trying a glass of the La Marca Prosecco followed by a Seven Oaks Cabernet Sauvignon from the J.Lohr winery in Paso Robles.